J is (in the words of the fabulous Joanna Grace!) a sensory being. J experiences the world in a primarily sensory way, and loves all sensational things, from the wind and rain on her face to the sound of music or the wind in the trees. For her, presents aren’t about the typical ‘top 10 must have toys of the year!’, she engages in the sense of things, and they don’t have to be expensive, or even physical objects! 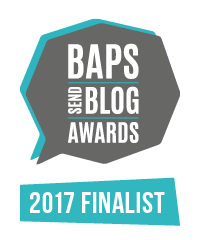 I wrote a post previously (eek, was it really back in 2016!? ), and the last item is probably still the best present you could give to J. From a walk in the woods to a trip to the theatre. This time I’m going to stick to some more practical themed gift suggestions…. J (and many other sensory beings) loves to explore things in her mouth and she enjoys the sensory feedback she gets from chewing on her favourite things (much like you might distractedly chew the end of a pencil or the toggle of your hoodie). We have a number of things specifically made for chewing (some of which J actually choses to chew rather than the myriad of things that she shouldn’t – like the TV remote!). 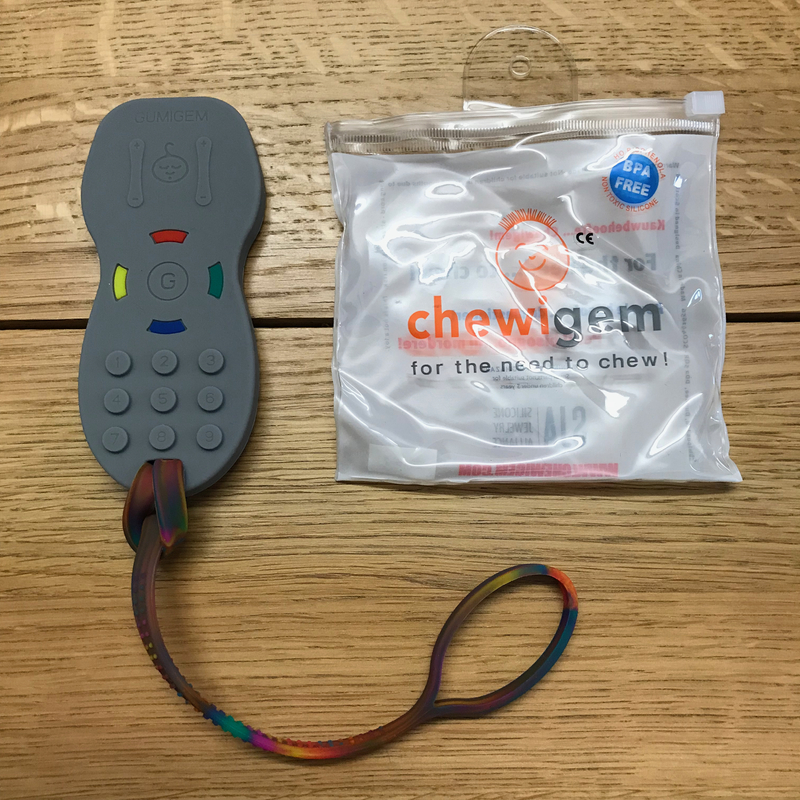 Our favourites are a fab chewable TV remote from ChewiGem, which has rubbery little buttons for added tactility (is that a word!?) and I’ve just ordered these Chewipal Straps to fix them to J’s wheelchair as I always feel lanyards could be a bit of a choke hazard even with the quick release. We also have a few of Sensory Direct’s Chewy Buddys and a fab Neckerchew by Cheeky Chompers which as a dribble bib, with a chewable tip, is dual purpose! There are a lot of cool accessories for baby and toddler buggies that are transferable to wheelchairs. Most things are aimed at the parents rather than the toddlers themselves, so are not always young in style, like cup holders, buggy clips (we wouldn’t be without our giant carabiner by JoJo Maman Bebe – although it’s not exactly a festive Christmas gift item!) and buggy organisers. 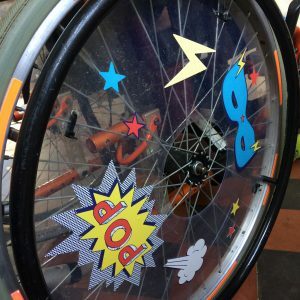 I’d also recommend having a look at cycle and kids scooter accessories too! Lights, bags, bottle holders and even toolkits can come in super handy for wheelchair users! 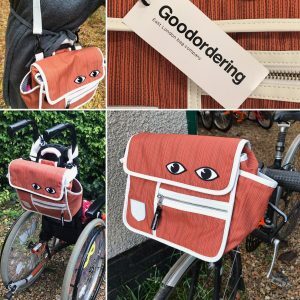 I love the handlebar bag I recently got from from Goodordering, that also works as a great wheelchair bag and a cross body bag! So I don’t have to keep moving my stuff from bag to bag anymore (OK. Maybe this is more of a gift for me than J, but it does mean I can carry all her stuff hands free!)! 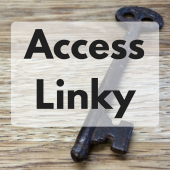 However there are some other fab items which are wheelchair specific…. We got J some fab LED Spinnerz castor front wheels for her wheelchair for her birthday! They match the LED wheels her brother has on his new micro scooter! I love that they both have funky wheels! The other thing I’d love to get are a set of beautiful Izzy’s Wheels spoke guards! At the moment J has a budget version, in that we’ve decorated her plain clear plastic spoke guards with some superhero wall decorations from Dunelm Mill and in the winter we exchange them for snowflake window decals! J always wears at least one more layer of clothing than her brother. She doesn’t self propel her wheelchair, so she’s not as active as W, and doesn’t generate as much body heat. She also gets colder hands and feet anyway. Warm base layers, slippers, slipper socks and mittens (snow mittens are best for J as she likes to chew them, so regular ones get soggy!) are all winners! Those microwaveable oat warmers are great too, to pop on her lap if we’re going out on a particularly cold day. We’ve had various cosy toes and snuggly coats, but the best, most versatile cosy by far has been our Bundlebean! 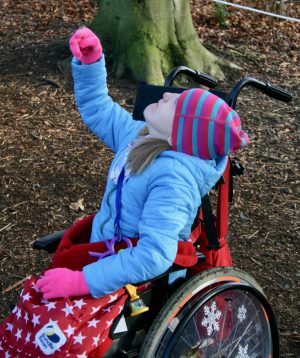 It’s a fleece backed showerproof blanket, with simple elastic and velcro straps, and adjustable elastic corners at the base, which make it a universal fit for various different buggies and wheelchairs. The one J is pictured with here is actually the older style toddler size, which we’ve still been using! I’ve just ordered her the child wheelchair size in one of their new fab prints! 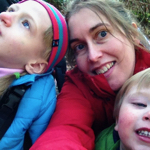 Willowbug also have a great range of outdoor wear for wheelchair users. Their back opening coat is up there on J’s Christmas list! Last thing in theme is onesies. The last couple of years I’ve bought both kids a fleecy animal onesie. They are great for keeping warm and snug at home, or worn over clothes to keep warm out and about, as well as fun dressing up. J isn’t into imaginative play, but it’s fun for her to be included in games with W and friends…. 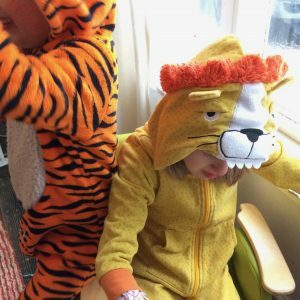 and I may have selected them based on which may make good costumes for World Book Day too… win win! it non spill yet drinkable from any side! It started as a toddler product, but they now do a whole load of different styles for kids and adults so they are great for any age! Eating can be a bit of a messy affair so J usually wears a bib. Lots of the toddler bibs are a bit small for her now, and can look a little young for her anyway. 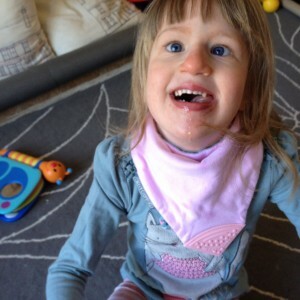 Tabard bibs from Care Designs (by Bibetta) are our favourite solution. They come in a variety of sizes, from junior to adult and they are easy to wash and quick to dry. They’re not at all bulky and they have a fold out base (same sort of concept as baby pelican bibs) so spillages don’t land on J’s lap! Music to download or CDs to listen to are a definite winner! We wouldn’t be without our iPod, and recently got this fab little portable UE Boom 2 wifi speaker from John Lewis! It’s been so handy as you can move it easily from room to room, and take it off on holiday. Ours is not a smart speaker, but they can be especially great for disabled people, do check out Wheel Chic Home’s gift guide for some suggestions! 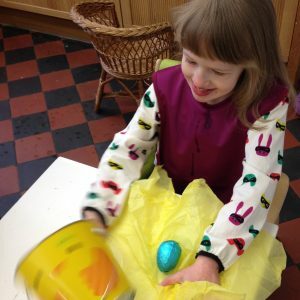 Also, our toy box is full of super percussion toys, and we also have a lovely little ukulele that J makes some surprisingly lovely little tunes on as she strums and plucks the strings! I’d really love to get a real upright piano… maybe once we have more space! 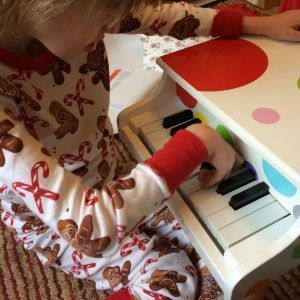 The piano features heavily in J’s music therapy, and of course all of the family would enjoy it (I’d love to learn to play properly)! However for now, we have this little Janod wooden toy piano from John Lewis….. move over Elton John! So I think that’s me for now (this was meant to be a short post!). Do you have any must have gifts ideas you could share!? If you are on instagram, do check out the hashtag #InclusiveChic as we are asking people to share their ideas… and if you join in you are in with the chance of winning some beautiful snowflake tree decorations (open until 5th December)! Brilliant ideas here thank you ! 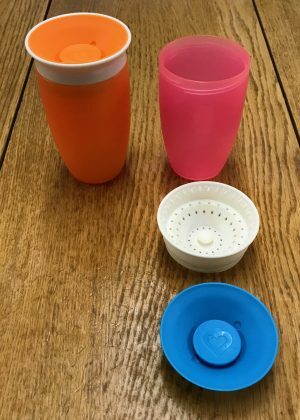 We loved our munchkin 360 cup – must must must remember to take it fully apart and wash it thoroughly otherwise it can be pretty yucky! Thanks so much for linking to #spectrumsunday and I hope to see you again next time.